Baby KERF, who has been nicknamed Baker within our family until his real name is debuted, received a package in the mail this week from my mom, Grammie Buzz. 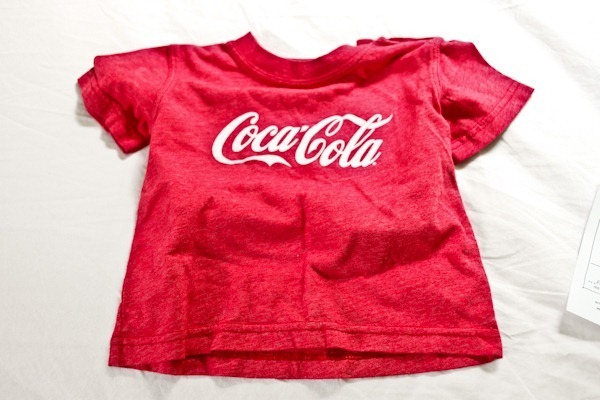 Grammie recently visited the Coke museum in Atlanta and let me know she had purchased something red for the baby. She is a die-hard believer of real Coca-Cola for all kinds of ailments – from headaches to hangovers. She thinks it’s one of the best substances on earth! I love the hilarious little notes your mom writes! 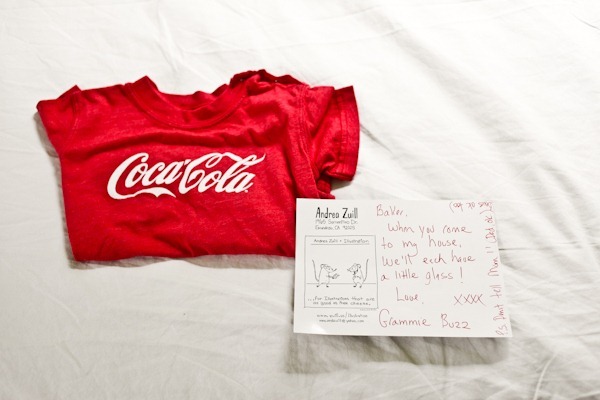 I’m also a believer in real Coke – with real cane sugar! You can find it in Latin markets in a glass bottle, the real deal! Awww! He’s going to love that shirt. I’m down in Atlanta, and my Kroger has started selling “real” Coke–with sugar instead of syrup. It’s more expensive, and I still rarely drink it, but man, is it yummy! My husband is(was) a huge Coke fan and has no less than 15 tshirts with some sort of Coke emblem. He thinks it’s such a representation of America and used to collect EVERYTHING Coke-plates, cups, silverware, wall hangings, S&P shakers……he even had a Coke themed guest bedroom and bathroom when we met. It was a little much for me and my taste! We were just laughing about that last night and how we slowly packed up the Coke things as I moved in. Maybe we’ll have a Coke themed basement/man cave I our future. Has he been to the museum? He will go nuts over the showcases of Coke stuff. We inherited a Coca Cola ceiling fan when we moved into our apartment. I almost threw it straight in the trash, but I decided maybe someone would want it. I still have to get around to posting it on Craigslist or EBay. That’s so funny! Grammies always give the best snacks! oh my, this is SO SWEEEEEEEEEEEEEEEEEEEEET! I can’t wait for my mom to be a grandma to my little one! She’ll be the best! Phew! So glad he can have a bit of coke (I’ve been letting the Bears have some for several years.) And fun to hear from some coke lovers out there! The pause that refreshes! Yay! 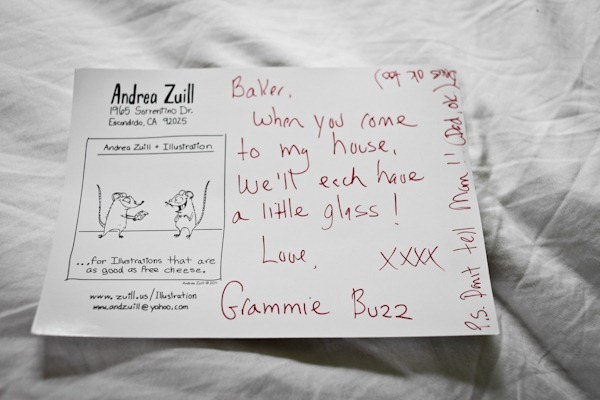 I picture Gramma’s Buzz’s house being a cornucopia of non-“real” foods for little Baker. I think I remember the Bears being allowed to have some cheese curls there once? The shirt is really cute. I’m sure he’ll love it. Hahah yes, I think they were allowed lots of treats – after a healthy dinner of course! Cheese curls went on the blog. The many other treats remain a grammie secret! One of my great aunts loved Coke and would chew out any family member who would dare to bring a Pepsi product into her house! Coke is usually what I reach for when I get a headache or stomach ache on a rode trip. That note is so sweet! I have to say, I agree with the theory it is a cure for most things. We just visited my parents this past weekend, & my mom had a piece of wood with a saying on it that was purchased for her & my dad by one of their grandkids. It said, “What happens at grandma’s house, never happened.” 🙂 I thought that that was funny! My father is the same way about Coca-Cola – he believes it is a cure-all. Whenever we got a bump or a scrape growing up, he would tell us to “put some ice on it and have a glass of coke”. The irony was that I was once diagnosed with extremely low blood pressure and my doctor recommended that I increase my caffeine intake to help with it. When I told him I didn’t drink coffee, he said “well, just have a little glass of coke every once and awhile”. My dad could not stop with the “I-told-you-so”s after that. We still tease him about it whenever someone gets a bump. Did you ever consider adoption? Not at this point, no. Why would you ask that ? I agree! If I’ve had a little too much all I want is an ice cold Coke. It always cures my sore throats and breaks up the phlegm(gross I know!) when I have a cold! haha! Love it. Grandmas are seriously the best. Rules are always different as grandmas house! Love it! The only time we got coke or sweets at all really was at my grandparents. As soon as we walked in, my Papa would offer us a coke and say there was ice cream sandwiches in the freezer. It was always something to look forward to! You’re doing great! For meals to freeze…quiche’s!!! I made quite a few of these and was so glad, they are healthy and packed full of necessary vitamins especially after having a baby. Other suggestions are homemade pizza and then freeze each slice individually; homemade soups/stews; taco meat; meatloaf; sheppard’s pie. Hope these help. You look fantastic!